As required by law, North Carolina follows the terms of the federal Nursing Home Reform Act, referred to as OBRA ’87. This ensures that your training fully prepares you to offer a high quality of care to patients and residents in any type of healthcare facility. The following is a guide through the five major steps you must take to become certified and registered as a Certified Nurse Aide (CNA) in North Carolina. Congratulations! You want to learn how to become a Nurse Aide I in NC. There are two levels of nurse aides in North Carolina: Nurse Aide I and Nurse Aide II. The first step is to become a Nurse Aide I by choosing a training and testing path that fits your situation and leads to CNA certification in North Carolina. The North Carolina Department of Health and Human Services (DHHS) maintains the NC Division of Health Service Regulation (DHSR). The Division is responsible for approving Nurse Aide I training programs and for maintaining the Health Care Personnel Registry. To work as a Nurse Aide I, you must be in good standing on the North Carolina Nurse Aide I Registry. That requires completing a Nurse Aide I training program and/or a competency evaluation program. Complete a state-approved Nurse Aide I training program and competency test. Obtain a training waiver and complete the Nurse Aide I competency test at a facility offering a state-approved program. If you are already an RN (Registered Nurse) or an LPN (Licensed Practical Nurse), you must meet the state licensing requirements. Within these three paths are seven (7) routes you can choose between to become eligible to take the competency examination and apply to be placed on the NC Nurse Aide I Registry. Route E1 – Candidates are eligible to take the state CNA exam after successfully completing a North Carolina state-approved Nurse Aide I program. Route E3 – Candidates are eligible to take the exam after completing a Nurse Aide I refresher course at a NC state-approved community college or proprietary school. Route E5 – Candidates that are currently enrolled in a NC-approved nursing education program to become a Registered Nurse or Licensed Practical Nurse can take the Nurse Aide I exam within two years of completing the NC-approved portion of the nursing education program. You must pass both portions within two (2) years after completing a refresher course or within three (3) attempts. If you fail to pass the test within three attempts or do not take the exam within the two-year time period, you will have to complete the training program again and take both sections of the exam. If you fail to take and/or pass both exam sections within two years of training, and you change your eligibility route, then you are required to take both portions of the examination. If you are eligible to take Route E8 or Route E9, you must take and pass both sections of the CNA state exam within two (2) years of the waiver approval date or within three (3) attempts. If you do not meet the requirements of passing both sections within three attempts or the two-year time frame, or you change your eligibility route, then you will have to complete a NC state-approved training program and retake both portions of the exam. Anyone who decides to change eligibility routes will have to take both portions of the examination. If the waiver is approved, complete and pass the exam before the Registry expiration date within three (3) attempts. If you fail to pass both exam sections within the three attempts, you will have to complete training at an NA I training program approved by the state and retest. If you decide to change your eligibility route, you will have to take both portions of the CNA examination. If the Registry expiration date has passed, applicants will have to take a state-approved training program or complete a refresher program, and then test under route E1, E3, or E5. If you do not pass both portions of the NC exam as required, you will have to complete training at an NC state-approved training school and retake the state exam. You must take both parts of the NNAAP CNA examination if you change your eligibility route. If the Registry expiration date has passed, applicants will have to get training at an NC state-approved training program before taking the exam again. Competency is proven by passing the National Nurse Aide Assessment Program (NNAAP) which was developed by the National Council of State Boards of Nursing, Inc. Pearson VUE is the state-authorized examination administrator in North Carolina. Pearson VUE offers both parts of the exam which includes a written examination and a skills evaluation. You can request an oral examination in lieu of a written examination, and it is offered in English or Spanish. You will need to pass both sections of the competency exam to qualify for applying to the NC Nurse Aide I Registry. In Step 3 of this guide, you will get more detailed information about the NNAAP examination in North Carolina. Applicants for the North Carolina Nurse Aide I Competency Exam should be aware of a new rule that went into effect on March 1, 2016 (Rule 10A NCAC 130.0301). The new rule says that anyone interested in taking the exam must complete a state-approved training program before being eligible to register or schedule an examination through Pearson VUE. As you will also read in Step 2 on Nurse Aide I training, there are requirements as to when the training is completed, including a refresher course. It is important to know and understand the CNA certification requirements so you can get certified as quickly as possible. Training to become a CNA in North Carolina is an educational process that teaches students how to complete certain CNA tasks as an employed Nurse Aide I. The curriculums may vary from program to program, but they all include a minimum level of instruction and hands-on skills training so you can deliver competent care to patients and residents. Each school can add additional requirements to their program. For example, Wake Tech Community College requires students to have advanced English language skills. When you locate training programs of interest, the first thing you should do is call the school and get specific information on their requirements to sign up for a Certified Nurse Aide program. 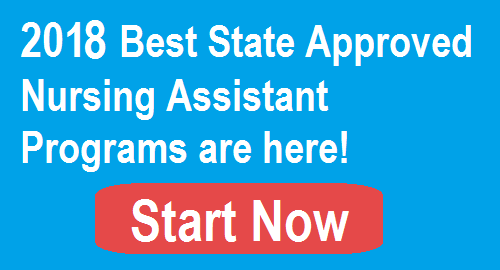 The most important tip to adhere to when searching for a training program is to only consider the North Carolina state-approved Certified Nurse Aide I programs. There is a list of 188 state-approved Nurse Aide I training programs on this site (updated in March 2017). The list is also available online at the North Carolina Department of Health and Human Services Division of Health Service Regulation (Health Care Personnel Education and Credentialing Section). These state-approved programs prepare you to earn CNA certification. Charlotte Mecklenburg Chosen Health Care Institute, Inc.
Durham Durham Ideal Health Institute, Inc.
Raleigh Wake Care One Health Training Institute, Inc.
Wilson Wilson Fast Track Career Prep, Inc. Since the age limit for CNA training programs is 17 years old, North Carolina allows high schools to offer CNA training programs that are managed by the North Carolina Department of Public Instruction (NCDPI). The high school-based programs meet the same strict training standards as programs offered in other facilities. North Carolina schools of nursing can also offer students a certificate of completion for taking Nurse Aide I training while working on an RN or LPN degree. The North Carolina Board of Nursing (NCBON) assesses the Nurse Aide I component and notifies DSHR as to whether it meets Nurse Aide I training requirements. When the RN or LPN obtains the certificate of completion, it qualifies the person to apply for competency testing. Some nursing homes also offer state-approved nurse aide training to employees. The nursing home has to be approved through the North Carolina Division of Health Service Regulation/Health Care Personnel Registry Section/Center for Aide Regulation Education (DHSR CARE). CNA classes in North Carolina that are state-approved have gone through a credentialing process. The Division of Health Service Regulation’s Health Care Personnel Education and Credentialing Section approves these programs. The school or facility submits a Nurse Aide I Training Program Application Packet (DHHS/DHSR-4510 – Rev 2-2015) which provides the program details, including the clinical sites. There are a number of forms that are submitted during the credentialing process, and one is the Faculty Approval Request Form for each faculty member. The Nurse Aide I Training Faculty Requirements Worksheet delineates the requirements for approval to teach a state-approved CNA I training program. Two important positions in a Nurse Aide I training faculty are Program Coordinator and Instructor. Have at least two years of experience as a Registered Nurse in the U.S. There are additional requirements for each of the two roles. A Program Coordinator must also have at least one year of RN experience in a long-term facility either working in the facility or supervising/teaching students in a skilled nursing facility. An instructor must also meet at least one of three conditions: completed a course in adult instruction, has experience teaching adults, or has experience supervising nurse aides. The Nurse Aide I training program curriculum must meet the minimum requirements set by the state of North Carolina. The curriculum must consist of at least 75 hours of combined classroom, laboratory, and clinical instruction. A minimum of 16 hours of combined clinical and laboratory training must also be included in the 75 hours. A state-approved curriculum covers the core content found in 23 modules. Each module represents knowledge in a particular area that Nurse Aide I students must know. The curriculum also meets federal requirements for those who will work in a federally certified long-term care facility. Each student will perform a minimum of the 15 skills starred on the Performance Skills Checklists Summary in Appendix A of the “State-approved Curriculum Nurse Aide I Training Program” in a proficient manner under instructor supervision as part of their clinical training. These direct patient or resident care skills are performed after the student has demonstrated proficiency in the laboratory setting. The length of the Nurse Aide I or Nursing Assistant I course is 9 to 16 weeks, depending on how many times the class meets. Some schools offer different options. Hospital-based course – course covers the required NC Nurse Aide I state curriculum in the classroom and laboratory, but the clinical rotation is in an area hospital to earn a total of 172.5 hours. This course has special requirements beyond the traditional courses. Students must be 18-years old, pass a criminal background check and drug screening, and be certified in Basic Life Support by the American Heart Association. The fee for each course is $254, but you must also buy the textbook, supplies, equipment, and a uniform for approximately $200. You also have to provide evidence of a negative TB test. Students must pass a criminal background check through FirstPoint and show proof of immunization to Hepatitis B or decline to receive the vaccine. Students can qualify for financial assistance. This example gives you an idea of the type of options available for CNA training in North Carolina. In every case, CNA programs online will require physical attendance for laboratory and clinical training per state requirements. There are two groups of people who may need to take a CNA refresher course in order to get or remain on the registry. A Nurse Aide needs to refresh their skills before re-taking the competency exam. For example, you got a Training Waiver, but the registry expiration date has passed so you are required to complete a refresher course. EMTs, medical office assistants, and paramedics who need to master additional skills to pass the Nurse Aide I Competency Evaluation Exam, but do not need to repeat the training program, can also take a refresher course. The refresher course for the nursing assistant is a basic review of the Nurse Aide I curriculum and the performance skills competency exam. It does not include clinical training. Any North Carolina state-approved Nurse Aide I refresher course will have similar requirements. Pearson VUE administers the written (or oral) exam and the skills evaluation portions of the competency exam. You can apply to take the CNA exam if you meet one of the eligibility routes described in Step 1. Pearson VUE has an online registration process that requires creating an account. The account creation process creates an ID and assigns a password. It is important to accurately complete all the required fields which are asterisked. Fees are non-refundable, so if you are unable to keep the appointed exam time, you will have to pay the required fees again when re-scheduling. The fees are also non-transferrable, meaning they cannot be applied to the new exam registration or used for any other purpose. You are responsible for paying the fees unless you are working as a nurse aide in a nursing home that participates in Medicaid/Medicare programs. Per federal and state law, if there is a signed written commitment or employment agreement on file in a Medicaid-certified nursing home, the employer must pay the examination and re-test fees. If you are employed as a nurse aide by a Medicare/Medicaid facility within 12 months of passing both parts of the test, the facility may reimburse you for the cost of the test. There are two types of testing locations: regional testing sites and in-facility testing sites. People with documented disabilities can request special accommodations. These are sites located in various locations around the state where anyone can test. A list of these sites is available on the NC Nurse Aide website and is accessible through Pearson VUE. You will register for a specific test date of your choosing based on the route you chose as explained in Step 1. The scheduling guide is located here. The in-facility testing sites are only available to those who chose route E1, E3, or E5 in Step 1. The instructor will give you an INF code and a test date. Nothing else is permitted in the exam room, so do not bring any devices like a cell phone or beeper. Testing will begin on time. If you are late, there are no refunds. There are two parts to the North Carolina NNAAP test: a written (or oral) examination and a skills evaluation. These two parts are quite different because one is a multiple-choice exam and the other is a hands-on skills demonstration. This part of the CNA exam consists of 70 multiple-choice questions that must be completed in two (2) hours. The oral version is offered in English or Spanish and has 60 general multiple-choice questions and 10 multiple-choice questions that test your ability to speak a minimum amount of English, including commonly used nurse aide words. It is wise to review the practice exam of sample questions that Pearson VUE offers on its website or to find a longer test online. The more you practice, the easier the exam will be. This part of the CNA test in NC is designed to test applicants as if they were in an actual caregiving situation. The test is administered by a Nurse Aide Evaluator, and all of the equipment is provided. Candidates volunteer to play the role of a patient/resident. There are a number of skills that you may be asked to demonstrate, but some are called a “Critical Element Step”. Everyone must be able to perform these “Critical Element Step” skills, along with the other randomly selected skills, to pass the exam. The randomly selected skills will include a measurement skill. Upon completion of the Nurse Aide I examination, the Nurse Aide Evaluator will fax the answer sheets for the written examination and the results of the skills evaluation to Pearson VUE. The official score results are available within ten (10) minutes. If you pass, you are on your way to certification. If you fail, you will have to re-test one or both parts, depending on your results. Getting listed on the GA CNA Registry, and remaining listed, is required to continue working as a Nurse Aide I in North Carolina. It is up to the applicant to ensure all the information remains current and that all requirements are met for renewing the Registry listing. Once you pass both the written (or oral) examination and the skills evaluation of the NNAAP competency evaluation test, your name is sent to the State Nurse Aide I Registry. It takes approximately 2-5 days for your name to be listed, and it is free. Once your name is listed in the Registry as being in good standing, you are certified to work. A Nurse Aide I maintains active CNA Registry in North Carolina by working at least eight (8) hours as a paid nursing assistant every two years. Your duties must be those of a nurse aide which are the 22 skills listed previously. Your duties must also be supervised by a Registered Nurse. You should take special note that the renewal date is from the last qualified work date and not the date you send the form in. For example, if you last worked a year ago, your renewal will be for 24 months but will expire in another year. Registry listings expire at the end of the month. What happens if the certification lapses because you did not work at least eight paid hours of nurse aide duties, or you let your listing expire? You must take the North Carolina Nurse Aide I examination. Once you are registered to test, you must complete testing within two years of registration. North Carolina does not have reciprocity and will not allow anyone to transfer their Nurse Aide listing from another state. The only way to get a NC Registry listing is to pass both parts of the competency exam. Once you get CNA certified, you can be fully employed in North Carolina. However, the supervising RN or LPN will validate your competence to perform specific duties. Your supervisor is also responsible for assigning you duties for the care of each patient and resident and for regularly monitoring the care you provide for the patients or residents. The skills that are included in the required training curriculum reflect the typical work duties of a Nurse Aide I. The specific tasks will all fall within the 22 skills categories discussed earlier. The North Carolina Board of Nursing groups Nurse Aide I tasks under six broad categories. They are personal care, body mechanics, nutrition, elimination, safety, and special procedures like taking vital signs and changing dressings. Anyone who wants to find employment in the healthcare industry can get CNA certified in North Carolina in a short period of time. After a period of employment, many CNAs decide to continue their education and become an RN or an LPN. Being a CNA is a rewarding job that brings a higher quality of life to patients and residents and a personal satisfaction that comes from helping others in need. How Do I Find CNA Programs Near Me? How to Get CNA Certification?